George Chambers is part of the Senior Executive Service (SES) and serves as the Executive Director of the Office of Information Technology Infrastructure and Operations (ITIO) and Acting Executive Director, Office of Enterprise Application Development (OEAD) for the Office of the Chief Information Officer (OCIO) in the U.S. Department of Health and Human Services (HHS). In those roles, he has responsibility for the lifecycle development, implementation, support, and operations of shared enterprise solutions that assist federal agencies within HHS such as NIH, CDC, FDA, CMS, and IHS achieve their mission goals. In years prior to joining HHS, Mr. 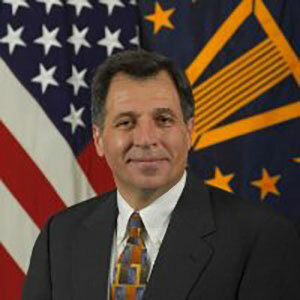 Chambers served in an SES appointment as Principal Advisor to the Assistant Secretary of Defense, Health Affairs. Mr. Chambers came to the federal government from private industry where he directed the selection, acquisition, configuration, and deployment of enterprise scale medical and clinical support systems for acute care, ambulatory, in-patient, and academic research facilities. Mr. Chambers holds a Bachelor of Science degree in Physics from the University of Maryland, College Park and a Masters of Engineering Administration from the George Washington University in Washington, DC. He is also currently a PhD candidate in Health Policy and Translational Clinical Research at the University of the Sciences in Philadelphia, PA. For philanthropy, Mr. Chambers is a founding member and served as Board President of Odyssey Charter School for 12 years. Students go to school free at this non-profit K-12 academic institution, are taught classic Greek language with content focused in mathematics, the sciences, and humanities, and perform scholastically in the top 5% of all public schools in Delaware.